Andy Wedderburn Stockport NHS Watch. Format – Whole group intro from him and questions from us. Commissioners: Clinical Commissioning Groups, NHS E commissioning some services nationally. He didn’t mention Local Authorities!!! So much for integrated NHS and social care. Contracts between commissioners and providers specify the type of care bought,using NHS standard contract. There are also 3 GP services contracts. As a patient moves through the system they can go to various providers. The Integrated Care Provider contract would make a single contract for all providers. A member of the public asked: WHY WOULD A SINGLE CONTRACT MAKE ANY DIFFERENCE TO PATIENTS? AS said it would make no difference – but it would provide an opportunity for a single provider to make a decision about the needs of the population and how to meet them better. BUT the plan is for multiple SUBCONTRACTS within the Integrated Care Provider contract, so that argument MAKES NO SENSE. He asserted that the Provider having direct conversations with other subcontracted providers would be better than the commissioner having such conversations. But he didn’t say why. Kevin Donovan said he was not happy about talking about contracts as a solution to patient care issues. The 2012 Health and Social Care Act is at the root of the problems. This is just tinkering with Lansley reforms. I asked, What about the pressure that Sustainability and Transformation Partnerships will become Integrated Care Systems? Nora Everitt said that in South Yorkshire and Bassetlaw there are already protocols that have to fit in with Integrated Care System protocols – so in areas that are already Integrated Care Systems, Clinical Commissioning Groups are no longer autonomous. David Savage said that discussion between commissioners and providers in a local forum may result in a decision to adopt an Integrated Care Provider. That would be a local decision. Nora said that Barnsley is going down the Integrated Care Provider route now and however they use it, they have to fit with the Integrated Care System. And if they don’t, they won’t get their full allocation of money. Andy Wedderburn from Stockport NHS Watch asked – how NHS England are going to make sure that predatory bids are going to be dealt with related to contracts with private providers – how is NHS going to be put in a position where it can bid fairly for services? He added that better contracts would make it easier for NHS providers to win contracts. Colin Hutchinson pointed out that the track record for well drawn up complex contracts is not good when you look at the big Cambridgeshire and Peterborough community health and old people’s services contract, Staffordshire cancer services and the east coast mainline contract. The risk of going down this contractual route is that it doesn’t have the flexibility that public professional service used to have. Kevin Donovan said he was worried about the basis of some thinking on this. He asked how much is derived from PWC and McKinsey, pointing out that cuts for his local Sustainability and Transformation Plan were done on basis of a report from PWC. But PWC has been lambasted widely. He doesn’t feel confident that the Clinical Commissioning Group and Council understand what’s happening, so they rely on such management consultancies. I asked about the NW London community services contract that is too cheap to pay for safe services, so local NHS trusts have not bid for it. So this contract is unlikely to provide safe services. He went onto slide 2 – What is different about ICP contract. Nora said that it was on the grapevine that the acute hospital trust will pick up the Integrated Care Provider contract. But they have no expertise in community and mental health services. That creates problems. The actual reality for patients and carers is that a single provider with no skills in all areas is not going to help. The problem is the processes the managers create – eg appointment letters that say if you don’t turn up you’ll be discharged. Colin Hutchinson asked what will happen to NHSE specialist commissioned services under these arrangements? They won’t be the focus of the Integrated Care Plan that’s been drawn up local the CCG. What will happen to those patients? AS: That still rests with NHSE – so any new Integrated Care Provider contract wouldn’t have specialised services as part of its scope. AS went on to state that integrated care was a focus of NHS England’s 2014 5 Year Forward View, which is based on Whole Population Health models. He went onto Contracts, saying why has NHS England developed the new Integrated Care Provider contract? He answered his own question by saying that there was a collaborative approach by local players to overcome barriers. eg Integrated Care Systems. He said local players have told NHS England that different contracts with different providers can be rigid and prevent collaboration, so they want different sets of services to be bought from one provider in the same way. 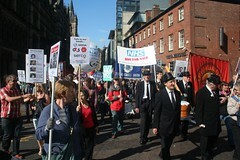 One of the Defend Our NHS York people asked, When allocating a contract, which comes first – needs or money? AS said bidders have to stick within budgetary limits. DS said, The Clinical Commissioning Group says “This is our budget.” Then potential providers propose how they’d spend the money. Ultimately there are budgetary constraints. It’s about meeting the needs of the population within that budget. Nora said, It used to be based on 80% quality, 20% costs. DS said that Clinical Commissioning Groups would evaluate bids in competitive tendering against criteria they’d set. Table 1 shows that clinical outcomes would be part of the contract. Colin Hutchinson said at the moment, Clinical Commissioning Groups have to carry out needs assessment. They will still have responsibility for having needs assessment done, but the consultation doc suggests the Integrated Care Provider can do it for the Clinical Commissioning Group. The Integrated Care Provider can also submit data analysis to show if they’ve improved matters. There is too much scope for the Integrated Care Provider to tailor the needs assessment to what they can provide with money, and then letting them mark their own homework. Colin Hutchinson: But this self certification process suggests weakness. DS said he wasn’t sure that would be how it would work. He said that the Integrated Care Provider does more needs assessment because of its role in meeting the needs of the whole population. The statutory duties of the Clinical Commissioning Group remain – how they perform that role changes. So it becomes more a strategic role in determining population needs. AS: The Clinical Commissioning Group retains its role in holding providers accountable. That might happen differently because the Clinical Commissioning Group would hold one provider to account instead of many. A member of the public asked: What about social care? It’s in a state of collapse, hugely underfunded. Who pays for it? It’s not free at point of use like NHS. How has this been thought through? And it’s under democratic control – but if it moves into NHS control that ceases to apply. AS: Local Authorities and Clinical Commissioning Groups would decide how much social care and social services should be commissioned through this contract. This is up to a local decision. Whether through an Integrated Care Provider or NHS Standard contract, the Local Authority remains accountable for those services and the Local Authority and Clinical Commissioning Group will have to agree the accountability processes. The contract won’t changes the accountability of the Local Authority for providing those services. Christine said, The Clinical Commissioning Group is holding the Integrated Care Provider to account – not the on the ground providers that the Integrated Care Provider has subcontracted to. An MP at a campaigners meeting in the House of Commons on Monday 10th September said the NHS is accountable but no one’s responsible. Colin Hutchinson: The Integrated Care Provider contract is a variant of the NHS Standard contract, but can’t see much in the Integrated Care Provider contract that’s applicable to the provision of social care services. Even if I agreed with the initial premise of contracting, I can’t see it’s fit for provision of social care services. DS: We’ve been talking with the Local Government Association and stuff in the Integrated Care Provider contract includes stuff from those discussions. But it still looks very much like an NHS contract because there’s no national standard template for a Local Authorities’ social care services contract. Local Authorities in that engagement exercise raised various issues for the social care provider market. We tried to put their concerns into the Integrated Care Provider contract but there’s a significant way to go. But it will only be in the testing of the contract that the degree of detail about Local Authority commissioned services will come out. 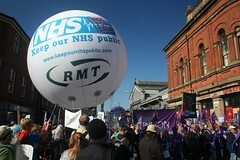 Initially NHS England had planned to test the contract first and then base consultation on that. We have brought that forward. Colin Hutchinson: The Local Government Association has been quite scathing about the Sustainability and Transformation Plan process. Are they more satisfied about the Integrated Care Provider contract now? I asked what’s the rush? And mentioned our 999 Call for the NHS Appeal about the Accountable Care Organisation contract payment mechanism. I asked why they are consulting on a contract that may not even be lawful. DS said NHS England brought the consultation forward as a result of the JR4NHS judicial review, because of the need for transparency. The downside is that what we’re consulting on is less developed. 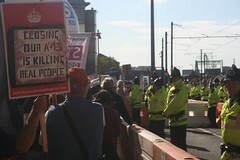 A member of the public asked –What about Dudley and the Dudley vanguard? AS: Dudley is one of the areas talking about adopting this Integrated Care Provider contract. The Multispeciality Community Provider is a care model in 5YFV designed to introduce integrated care. Q: Have you not learned from that process? Q: What about what Dudley people think? AS: what we’re consulting on nationally is what is core to the process. DS: Dudley Clinical Commissioning Group have come to the conclusion that a single contract of this sort for out-of-hospital services is what they want to pursue. We speak to them daily. Whether they can use the Integrated Care Provider contract will depend on outcome of the consultation and Judicial Review process. Kevin Donovan: What about the state of Russell Halls hospital? AS ignored this and said he wanted to move forward with his presentation. Slide 3 – key features of Integrated Care Provider contract based on experiences of Vanguards. There are different ways for GPs to take part in contract. Gives provider the budget with discretion to spend on preventive measures to improve long term population health outcomes. No one is using this contract yet. Can’t say any contract in NHS can only be held by public body or NHS org – have to treat all providers equally and assess only on basis of ability to deliver contract. But local NHS organisations are the ones with the desire and ability to hold an Integrated Care Provider contract. It’s the Clinical Commissioning Group’s responsibility to make sure there’s a provider that can deliver a safe contract. I said Scarborough and Ryedale CCG translated an MCP contract into the NHSE standard contract early this year, after NHS England said no one could use the ACO contract until further notice – so why introduce the Integrated Care Provider contract if everything it does can be done with the NHS Standard contract? AS: Demonstrates precisely the kind of checks and balances that are in place. It’s mostly true that there are minor changes to make the contract suited to the kind of care we want to offer. It’s not a radical change. I disputed that. I said the complexity of system wide contracts are beyond the Clinical Commissioning Groups , eg the Integrated Urgent Care Services contract for Yorkshire and Humber. The lead commissioner is having to pay the consultancy company Attain to tell them what to do. AS – didn’t answer this. A lot of destruction in NHS services is because of short term contracts and short term incentives – so why isn’t long term planning and stability being offered through the NHS Standard contract? AS: Clinical Commissioning Groups can commission for longer term contracts eg community and mental health services. Christine: what about wider provision in the NHS – where is the commissioning for allowing junior doctors to train? It’s not just about patients. There’s a shortage of all sorts of specialities and it’s vital that Junior doctors and other staff are allowed to train. How is that going to be written into the Integrated Care Provider contract? AS: Integrated Care Provider and NHSE standard contrCT dont talk about training becuase HEE deals with that. Christine HEE will hae to fit their trainee doctros withing this system then? CLin- christine’s poinit si vital – HEE pay some but rest has to come from provier ord. output of dr in training is less than qualified dr so from provider pov not atttarctive to offer dr training. No compulsoin on providers to provide that trainisng – there needs to be built into ICP contract a requirement to contribute to treaining of naitonal orkforce. Kevin – private sector to play role in STP – 2 USA cos including Cerner. And 2 GP Federations, majority in LLP Peninsula Health, with Virgin Care as a partner . This federation has been developing primary care model. How confident can we be that in 5-10 years Virgin Care won;t be running an ICS in Wirral. AS; experience from places they’ve talked to is that NHS orgs are in best position to get Integrated Care Provider contracts. Beatrice – fills me with dismay and dread – so many faulty contracts in existence – shortage of people to draw up sound contracts. Danger that Virgin Care and others could drive bus through them. 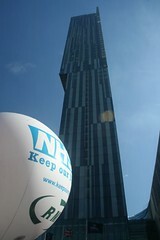 What you;re trying to do to National Health is an utter disgrace. Nora: Barnsely Integrated Care Provider – acute trust is rumoured to be elading on it – but hospital acute collaborative across SY and bassetlaw will lead managed clinical network for specific services. Bureaucraticmess so complicated, bound to fail, all being done in seret, public find out later. AS Don’t have any evidence that any other org than NHS will hold contract but have built transparency considerations into Integrated Care Provider contract eg re business plan shared with Clinical Commissioning Groups etc. 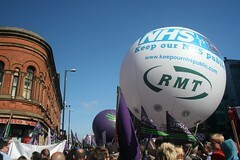 including contract mgt if non-NHS org hold contract that they can’t spend dosh if they’ve not met core reqtsof contract. Tis isn’t included in main Integrated Care Provider contract. Nora – any safegiarding for one orga to run all the locality ICPs in one area. checks and balances across way. DS take on baord concerns that same providers start to dominate market that could be cause for concern, take that point. Q: York Defend NHS -What is role of Sec of State in fragmented health service? Where is this leading to? Bid to bring in private sector to NHS. VCS – being introduced into mental health srvics and replacing staturtiy mHS – should they be doing this? And suggesting that people with mhs would benefit from cup of tea and chat – Yorks mhs shrinking by the moment, Not acceptable. Q: when would you expect Integrated Care Providers to become operational? AS: depends on outcome of consultation. Nora – you have to consult with the PUBLIC not such groups. Colin H – to be patient of an Integrated Care Provider would you have to register with the Integrated Care Provider. Does Integrated Care Provider have to accept registration of everyone ? AS: Yes not just people registered with participating GPs but unregistered people and people who move into area. AS: One legal entity has to hold the contract, but lots of providers can come together to decide which provider will bid. (He didn’t point out lots of providers could come together to form a joint venture or special purpose vehicle). Spa Medica – does the contract include bits about how the contract holder will work with other providers? SPa medica – Would existing providers as part of a pathway be decommissioned? Spa Medica: Is it like a prime provider model? Nora: Please circulate notes of the meeting to us for approval as correct record. AS said it wasn’t NHS England normal practice but they’d think about it. Christine asked about the possibility of gaming the contract outcomes, eg a behaviour change programme could discharge patient who wasn’t conforming, and so the outcomes could be gamed as a discharge, which could be construed as a positive outcome. I wrote this in my notes but didn’t ask WHERE IS EVIDENCE THAT ANY OF THE CLAIMS FOR IMPROVED PATIENT CARE ARE GOING TO WORK? RELIANCE ON SHARED PATIENT DATA – HOW DOES THIS NEED CONTRACT CHANGE?